Remember when I said I thought Rookie was probably mostly read by adults? 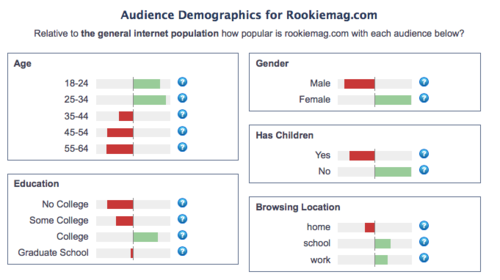 An astute tipster alerted me to this, represented below, which shows that their audience skews older than even 18–to-24-year-olds. I know! It’s almost eerie. I do not know, however, what that Alexa site even is, or if it is reputable. Rookie seems cool, it does, from what I’ve seen. But it feels like teen media made for adults, as does xojane, for that matter. It’s funny because when you work in teen media, one of the adages is that you write up—you write for a slightly older reader than your actual readers, because they’re all in a hurry to grow up and know what’s happening. So what does it mean that we now have these sites writing down to women? And it’s all affluent white women, of course.